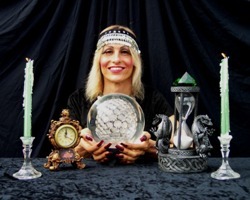 Kristal Kira is a crystal ball gazer and a tarot card reader. As a child, Kira and her friends experimented with a Ouija board. Later, she became fascinated with crystal balls and tarot cards. Kira owns a 100% pure quartz 200mm crystal ball which she uses for divination. A crystal ball is a crystal or glass ball device used for clairvoyance. Clairvoyance is the power of discerning objects which are not present to the normal senses. Tarot cards are pieces of paper with images drawn on one side. Tarot readers interpret the images. Tarot readings can provide information about what is known and what is unknown. Great costumes make Kristal Kira sparkle. Expect an exciting presentation for your next party because Kristal Kira wears colorful Middle Eastern gypsy attire with fancy coin head dresses and beautiful skirts. Fortune telling is wonderful entertainment for any occasion. "Kristal Kira displays a unique blend of wisdom and psychic powers." 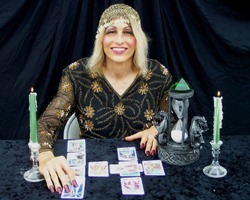 Kristal Kira should be your next fortune teller! Kristal Kira will enlighten your guests with her wisdom and guidance using her unique psychic powers.